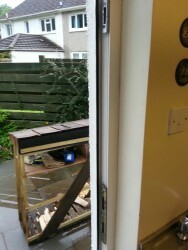 Repairing a UPVC Door the right way! The job was to repair the mechanism. It was an old Yale, obsolete. 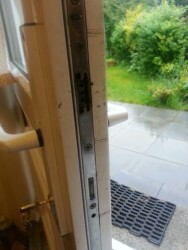 First of all I wasn't going to strip it out and give the home owner a 4 roller mechanism because that's a downgrade in security. So I measured it up and hit the trade sites looking for a mech that would be better or do the same job as this one. 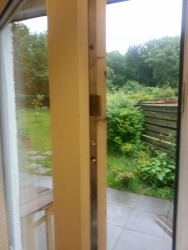 Mechanism shown left has no latch and the top deadbolt was intermitent. 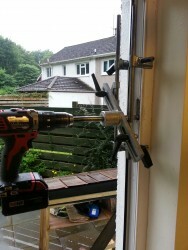 The new mech ans a 3 deadbolt Lockmaster. 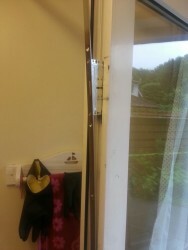 As you can see the mech needed to be fit to the door. As you can see the mech fits snuggly in the door. 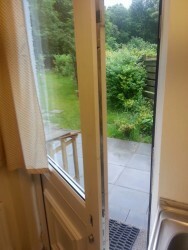 The door was cleaned thouroughly before adding the handles. The frame was reinforced with aluminium and I didn't want to damage the PVC frame. I used to old handles. 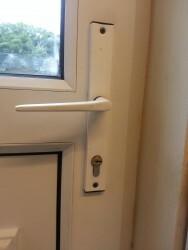 And finished it off with a Brisant High security locking cylinder.